Only recently have Chinese scientists fashioned a functioning replica. Modern seismographs are extremely sensitive pieces of equipment. By recording the slightest movements of laser light or magnets, these devices can detect the smallest of rumbles even when we can't sense them. There are networks of thousands upon thousands of seismographs set up across the globe that can accurately determine the epicenter of an earthquake -- its point of origin. And with all the data these clusters produce, we are constantly improving our understanding of these geological events, developing early warning systems and figuring out how to build the safest structures. We have technology on our side, of course, and yet the design of the earliest earthquake detection device isn't that different from today's versions. Only it was created nearly 2000 years ago, before people even understood what an earthquake was. Zhang Heng lived in China during the Han dynasty, and history remembers him as a scholar in many fields. He dabbled in astronomy, mathematics, science, engineering, cartography and poetry, among other fields of study and artistic pursuits. He served as a government official for much of his adult life, and was invited to the imperial court in his mid-30s by Emperor An in honor of his skills as a mathematician. He worked on calculating pi, mapped stars, and in tandem with his academic career, was an inventor. He improved the accuracy of inflow clepsydra -- a type of water clock that measures time by the flow of liquid -- and is credited with creating the first water-powered armillary sphere (a dynamic model that illustrates the movement of celestial objects). But Zhang Heng is most famed for inventing the world's first seismoscope. He introduced his device to the imperial court in the capital of Luoyang in AD 132, seven years before his death AD 139. 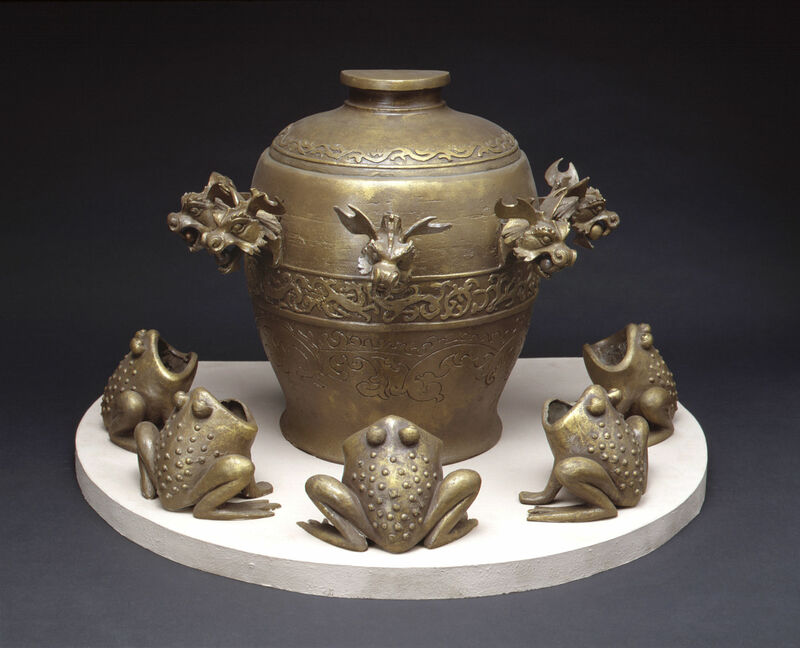 While there are no surviving physical remnants or illustrations of his seismoscope, historical descriptions depict it as being a large bronze instrument, similar in shape to an urn or a vase. Mounted on the outside of this were eight dragons, each with a bronze ball clasped within its jaw. 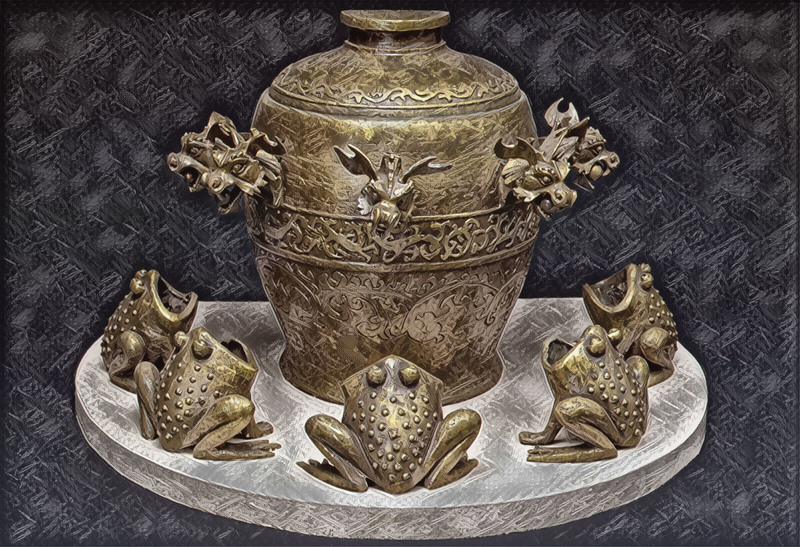 Directly underneath these mythical protrusions were eight bronze toads, mouths agape to receive the balls if they fell. Ancient texts are a little hazier on the inner-workings of the seismoscope. 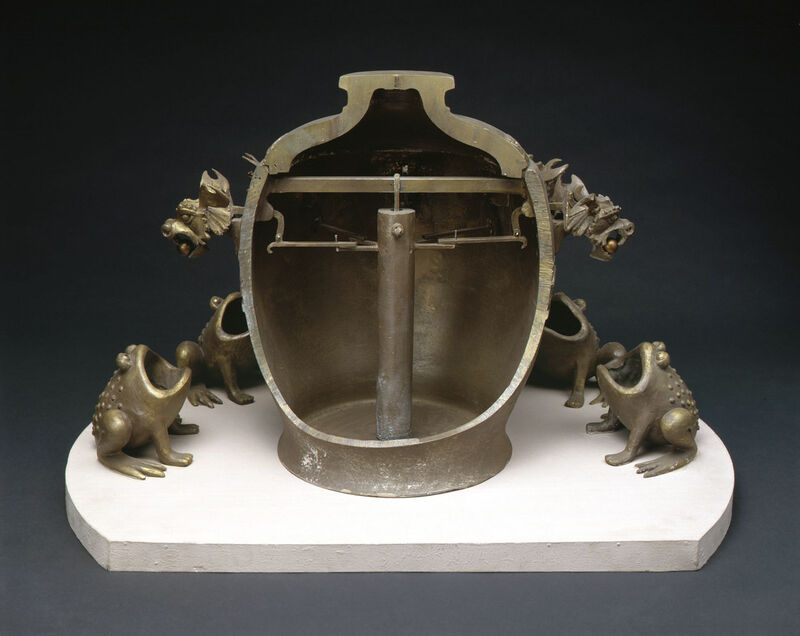 It's generally believed, however, that inside the hollow body of the seismoscope hung a pendulum, while lever mechanisms connected to each of the dragons flanked this pendulum on all sides. The shockwaves of an earthquake would cause the pendulum to swing, activating one of the mechanisms inside. The corresponding dragon would gift its ball to the toad, informing the court that not only had an earthquake occurred, but from which general direction the tremors came. You see, each dragon and toad related to a compass point -- north, northwest, west, and so on -- so the government would know where to send aid. Zhang Heng's invention was initially met with skepticism. His views on certain topics made him unpopular with some of his peers, and worse yet, his seismoscope was unproven. But as the story goes, several years later, a ball finally dropped. This in and of itself wasn't evidence it worked, of course -- no earthquake had been felt in the capital -- but days later a messenger arrived to report of a serious earthquake that originated hundreds of miles away, off to the west of Luoyang in the direction the now empty dragon mouth faced. Zhang Heng called his seismoscope Houfeng Didong Yi, meaning an "instrument for measuring the seasonal winds and the movements of the Earth." While many people of his time believed earthquakes had spiritual catalysts, he and a collection of other scholars were of the opinion the events were caused by winds and changes in air pressure -- bearing in mind this was way, way before the seed of plate tectonic theory sprouted in the early 20th century. In the centuries after Zhang Heng's death, other Chinese intellectuals were said have created successor seismoscopes of his design. Since nothing tangible survived the passage of time, however, historians of our era have struggled to reconcile these centuries-old accounts with a working replica of Zhang's device. Some even speculated it never existed. While the ornate nature of the seismoscope was well described, the exact mechanisms driving it weren't. Attempts to reinvent it in the 19th and 20th centuries proved unsuccessful. It remained unclear, for example, how an ancient pendulum design could be sensitive enough to detect earthquakes hundreds of miles away. Furthermore, how could the movement trigger just one mechanism and spare the others? In 2005, a group of seismologists and archaeologists from the Chinese Academy of Sciences announced they had created a proven, functioning replica. In their version, the pendulum itself doesn't interact with any levers; instead, it's suspended above another ball perched atop a thin pedestal. When the pendulum swings, it nudges that central ball down one of eight channels, where it hits a trigger system that animates the external dragon mouth. We don't know this is exactly how Zhang's model worked, of course, but it shows that only a minor reinterpretation of how the seismoscope is described in historical texts can lead to the creation of a sensitive, direction-aware device. Even though Zhang's device is nearly two millennia old, the working principle behind it is still commonly used today. A popular form of modern seismograph uses exactly the same properties of inertia, whereby a static base and hanging pendulum move independently of each other when the ground shakes. Only nowadays the pendulum is a magnet, and the induced current its swinging produces in the conductive base is the record. Converting the fluctuations into a digital signal allows such seismographs to document tremor intensity, their timespan, etc. Zhang's invention noted the simple occurrence of an earthquake, hence the name seismoscope. While Zhang's original design has more or less survived the test of time, we're still coming up with new monitoring techniques. Researchers at Stanford announced last year, for instance, that they had developed a method of detecting earthquakes using existing fiber optic cables. 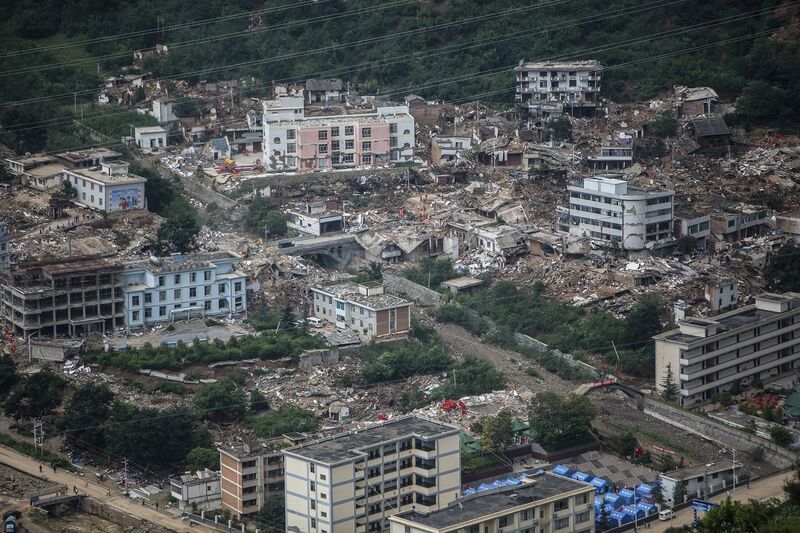 Predicting earthquakes before they happen, though, is something we're far from mastering. The best we can really do at the moment is use seismographs to warn of impending shockwaves just after an earthquake has struck. Typically, though, this heads-up is just a matter of seconds. Our awareness of shifting tectonic plates gives us the ability to vaguely surmise where earthquakes could happen in the future. Attempts at more precise techniques have shown promise, only to be relabelled unreliable later. There is some anecdotal evidence, however, that animals can exhibit strange behavior up to several days before an earthquake. The most reliable study of this phenomenon was published in 2010. Almost an entire colony of toads a biology post-grad was studying inexplicably abandoned spawning and left the pond they called home over the course of a few days. Five days after the toads initially began displaying strange behavior, an earthquake struck 74 km from the site. It's thought emissions from the surrounding earth as it reached maximum stress changed the chemical composition of the habitat, causing this reaction in the toads. It's bizarrely coincidental that these creatures featured in both the first credible study of the phenomenon, and so heavily in the design of the first seismoscope. Or perhaps, all those centuries ago, Zhang had already figured out they had a predictive capacity far beyond our own.